'Get Out' Oscar Buzz: What Are Its Chances in 2018? Could Get Out Win an Oscar? Will this scene be reenacted on Oscar night? Two-and-a-half months after Jordan Peele’s social thriller Get Out became one of the year’s biggest hits, Universal threw a party for the film on the studio back lot Tuesday night, transforming a row of suburban houses into an unnerving garden party straight out of Peele’s film. As stars Daniel Kaluuya and Allison Williams mingled and ate colorful Rice Krispies treats, I asked what kind of reactions they’ve gotten from people on the street since the movie’s release. 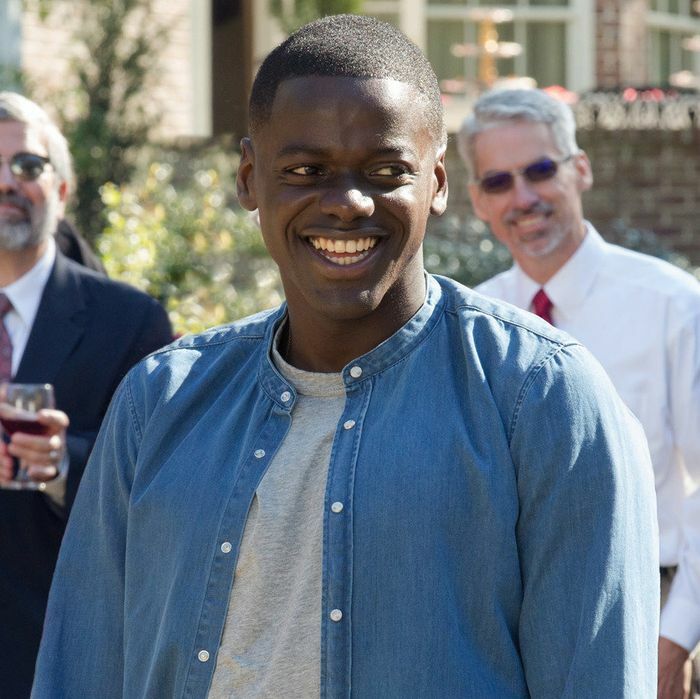 Indeed, it’s rare for a horror movie to earn awards-season buzz, but Get Out may be uniquely positioned to break that barrier. Peele’s film was a big hit with both audiences and critics — its 99 percent Rotten Tomatoes score tops every one of last year’s Best Picture nominees, even eventual winner Moonlight. More crucially, it’s a film about something, digging into thorny ideas about racial conflict in a way I suspect Oscar voters will appreciate. I like Get Out’s odds in Best Original Screenplay, though it will be up against scripts by Paul Thomas Anderson, Steven Spielberg, Alexander Payne, and Martin McDonagh. Still, voters often favor a comic wild-card pick in that category, and Peele’s inclusion just feels right. The acting races may be tougher to penetrate. Young men like Kaluuya often have trouble scoring with Oscar, and he’ll be up against a pack of tough veterans in Best Actor this year. It remains to be seen how Universal will position Get Out’s actresses: Will Allison Williams contend in supporting, up against co-stars like Academy favorite Catherine Keener and scene-stealer Betty Gabriel? A well-liked movie can often pick up a Supporting Actress nomination, but voters have a lot to choose from in this case. Will Hollywood Learn Anything From Get Out’s Success?